This contest is open to all current Naperville Central students. To enter, you need to follow @centraltimes on Twitter or Instagram (or both). Once you are following us on these social media, there is one final step, which is to share your answer to the question: If you could get a tattoo (or another one if you have one already), what would it be and why? If you are using Twitter, reply with your response to our contest tweet. If you are using Instagram, add your response to the contest post. Four-time Grammy nominee and CMA New Artist of the Year Hayes is the youngest male act ever to top the Billboard Hot Country song chart. 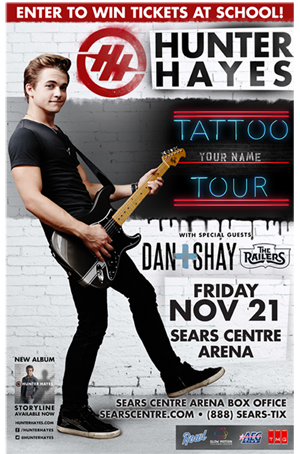 Now 22, Hayes is touring behind his second album, “Storyline.” Supporting Hayes on his tour are Dan + Shay and The Railers. A winner will be chosen on Tuesday, Nov. 18 after a 5 p.m. cutoff for submitting your posts to enter the contest, and tickets will be available for pickup from Mr. Carlson in Room 218 on Wednesday, Nov. 19. To win the tickets, you must be a current student at Naperville Central High School. This contest does not require that you are a subscriber to the print edition of the Central Times, but it does require that you follow the Central Times on social media, specifically either Twitter or Instagram (or both). Any student who wins a Central Times contest/promotion is not eligible to win another during the same school year unless otherwise indicated in that contest’s rules.